It all started back in 1981 when Andrew Roddham, Simon Whitehead, Andrew Pattle and Kevin Mallone started the original East Anglian Cyclemotor Club. You can read more about the early days of the EACC in The Moped Archive. Simon grew up and gave up this stupid cyclemotoring years ago but Kevin and the two Andrews are still involved and continue to support the EACC. 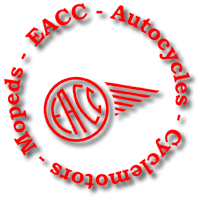 In 1986, to reflect the fact that its membership spread far wider than just East Anglia, the EACC changed its name to the National Autocycle and Cyclemotor Club. The NACC carried on in the spirit of the original club for almost another 20 years. But in 2006—the club’s 25th Anniversary year—things started to go horribly wrong. It’s difficult to pin down the underlying cause of the arguements—money, probably. The NACC had accumulated rather a lot of money over the years. The arguments in the NACC didn’t blow over and, in 2007, the club divided. The NACC was wound up; and two new entities were formed: a traditional club (that’s us, the EACC) and a limited company (the National Autocycle and Cyclemotor Club Ltd). The EACC inherited all the enthusiasm, and the NACC Ltd kept all the money ... and the arguments ... on reflection we think we got the better deal. The fact that the NACC Ltd is still struggling to sort itself out reinforces our view about the cause of the trouble: the arguments have stayed where the money is, while we, in the EACC remain ‘poor but happy’. So that, briefly, is how the EACC came back into being in 2007. Generally speaking, the relationship between the two clubs at the ‘grass roots’ remains cordial. Many people belong to both organisations. The EACC welcomes members of the NACC Ltd to its events. Several of the NACC Ltd’s local sections welcome EACC members to their events. Iceni CAM Magazine is another product of the arguments in the NACC Ltd. Although the EACC and IceniCAM work closely together, and many people assume that IceniCAM is part of the EACC, we are independent of each other. IceniCAM started as a magazine for the Suffolk Section of the NACC. It is run by Mark Daniels & Andrew Pattle. Mark was expelled from the NACC so IceniCAM had to become an independent publication. This all happened before the EACC was revived. Mark and Andrew decided to keep IceniCAM independent rather than bring it with the EACC because they’d become rather attached to the editorial freedom that independence gave them. Our aim has been to remain true to the spirit of the original EACC. We had a good attendance at our first AGM in November 2008, and that allowed our members to tell us the direction they wanted the club to take. That, after all, is the main aim of the club, and the reason it was formed: to be guided by the wishes of its members. People who come along to our events are impressed by our friendliness, enthusiasm and informality—and that’s how we hope the club will remain. We try to be as well-organised, open and ‘professional’ as we can—a lot of serious work goes to making our events light-hearted! Our Club has grown steadily since its revival and, in 2014, membership passed the 500 mark. Back in the days when the the original club was formed, 500 was a signifiant number and marked the point when things had to be more formally organised. For example, that’s when we had to get the club magazine professionally printed. Nowadays, technology allows us to cope better with this number of members and to continue on a purely voluntary basis.